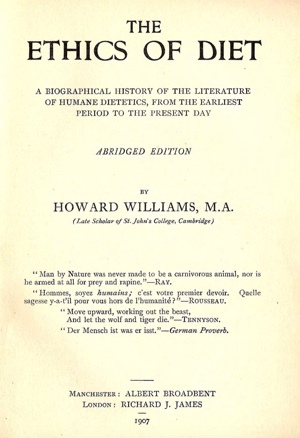 This copy of The Ethics of Diet by Howard Williams was picked up at a church rummage sale in a suburb of Baltimore a few months ago. Its subtitle is “A Biographical History of the Literature of Humane Dietetics, From the Earliest Period to the Present Day.” Its content is 2,500 years of thinking about why we should adopt a plant-based diet. The arguments presented in the book are not concerned about health or economics, but rather about ethics and morality of meat-eating. This book is important for at least three reasons. The first reason that his book is important is because nearly all the advocates of plant-based, ethical diet have been philosophers, not theologians. There are a few from the Christian church, but not many. Unity is what it is today because of its openness to the divine ideas of two of these philosophical advocates—Plato and Henry David Thoreau. Unity is open to the philosophical teachings because our authority in spiritual matters is not only the church nor only the Bible. We may claim to be Metaphysical Christians—in contrast to Catholic Christians or Evangelical Christians—because our authority in spiritual matters is what the philosophers (and Jesus and the Fillmores too) have taught us—the authority in spiritual matters is the transcendent voice that speaks to us in the inner workings of our mind. The second reason that this book is important is because of its influence on Mohandas Gandhi. Here is what Gandhi wrote in his biography: “My faith in vegetarianism grew on me from day to day. ... I went in for all books available on vegetarianism and read them. One of these, [was] Howard Williams’ The Ethics of Diet”. There is much discussion today about whether Unity as a denomination should express a public position regarding social and political issues in today’s culture and society. Those who favor taking public stands on social justice often quote Gandhi, and doing so is good. Gandhi’s teachings on the ethics of diet are just as valid as his teachings on the ethics of peace and justice. If we rely on Gandhi for guidance, which I believe we should, then his understanding of the ethics of diet needs to be proclaimed as strongly as our proclamations about peace. They are, as Gandhi taught (and as Charles Fillmore also taught) one and the same. The third reason why this book is important is because it reflects the spiritual teachings of the Fillmores. The Ethics of Diet was written in 1907 and it does not include the teachings of any persons living at that time. If it did, then it would likely have included the Fillmores and the Seventh Day Adventist leaders who influenced them. The Fillmore’s teaching on the ethics of diet are well known. The question before us is whether they are still relevant. I spent nine years as a member of the local Unity church in Santa Barbara. The community was quite loving and caring on so many issues. Yet the then-minister (who is gone now) had a Buddhist and vegan son, and used her relationship with him as a way to poke gentle fun at veganism from the pulpit. Potlucks were meat-lucks and cheese- and dairy-lucks. Baked goods, with their hidden animal ingredients, abounded at snacks after Sunday services. Since I am myself macrobiotic and very much aware of the energy in food, I did not care to indulge. Nor was I able to do much to raise consciousness and awareness around food. People were happy to eat the alternatives I might occasionally bring, but that wake-up feeling never came. This is to my regret because they are all lovely people. This taboo against speaking about our treatment of animals for food is so strong that I can often feel it as a living force. For several years, I’ve been speaking on Sunday mornings at progressive churches and centers, primarily Unity churches, and giving seminars on developing intuition. I find in addressing groups of even apparently progressive people that when I begin to raise the topic of the inherent cruelty to animals involved in viewing them as things, and the ethical and spiritual ramifications of our cultural practice of eating them, it seems I must push through an invisible psychic wall that absolutely resists hearing these ideas articulated. It seems to be the unconscious collective denial of the group. I have included these commentaries by Catherine Albanese and Will Tuttle because they highlight Unity’s ambiguity toward its own teachings. The sad truth is that at a time when Unity’s ambivalence about meat-eating is growing, the world is gaining more clarity each day about the harmful effects of eating animal products. I’ve tried to illustrate this in the video essay As To Meat Eating—We Do Not Eat Matter But Life. Can we, or should we, as a denomination, take a stand on meat-eating? Should we do that, even when I and many others continue to eat animal products? Isn’t that hypocritical? I don’t think so. Here is why I believe we should. Unity is, after all, a religion of ideals. We embrace the impossible, knowing that without vision the people perish.